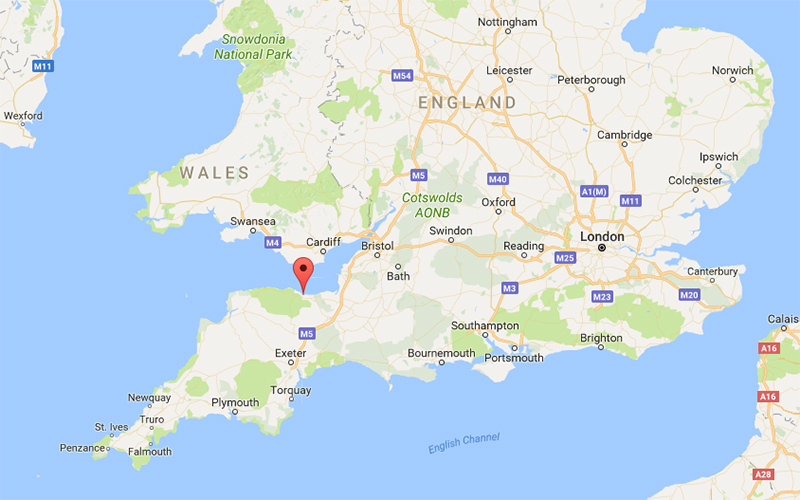 In the spring of 2017 we hiked the first section of England’s southwest coast path, a 630 mile (1000 km) trail that winds its way around the coasts of Somerset, Devon, Cornwall, back to Devon, and finally Dorset. On this trip we covered about 70 miles (110 km). 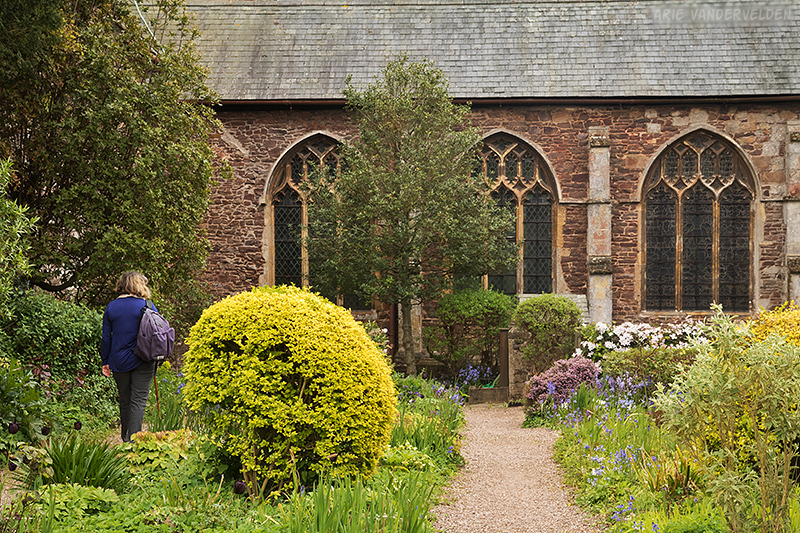 We took the train from London to Taunton, where we caught a bus to Watchet. The village of Watchet was the closest we could get with public transportation to our destination at Blue Anchor Bay. We phoned for a taxi when we got off the bus, but the local taxi-guy was out on a call. As we sat down and resigned ourselves to waiting, I noticed a rail platform behind us where people were gathering and looking down the tracks. When I was researching our trip I had noticed that a tourist steam-train runs between Watchet and Blue Anchor Bay, but I never considered it to be a viable form of transportation to get efficiently from A to B. I walked to the platform and spoke to the station master who informed me: she’ll be here any minute. 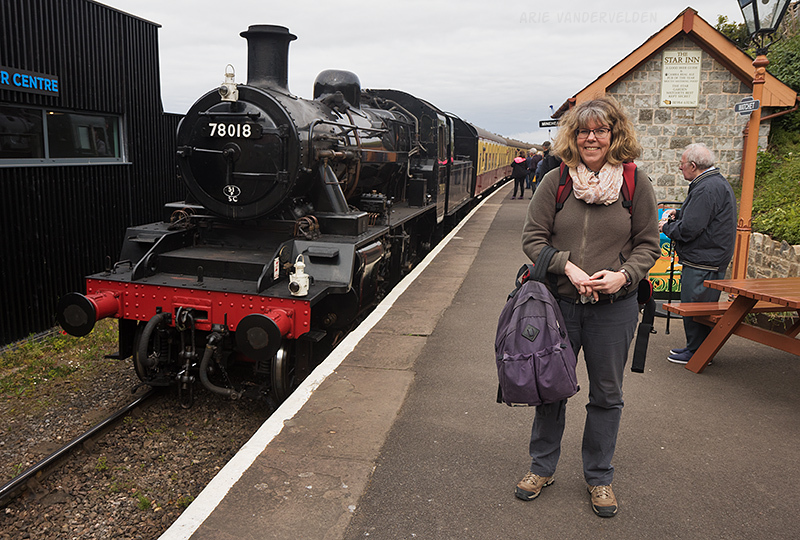 I ran back to get Diana and our bags, and just as we got back to the platform the steam train pulled in, hissing and puffing, belching steam and coal smoke. We wedged ourselves into the carriage and found two seats. The other seats were occupied by grey-haired old men, grinning ear to ear, consulting their train timetables. Everybody was having a nice time. 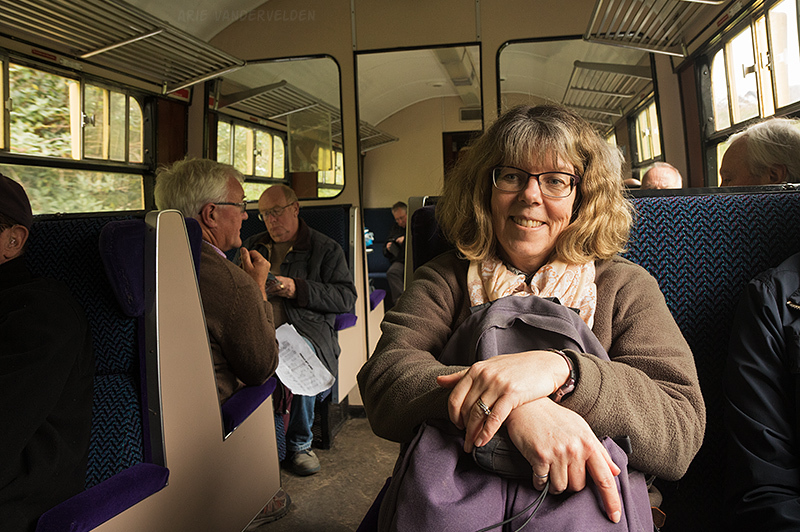 Diana inside the steam train carriage. With more hissing and puffing we set off into the Somerset countryside. Beside the tracks were more grey-haired old men, trainspotters, armed with cameras. We found our place to stay for the night, the Blue Anchor Pub, where we settled into our room and then went downstairs for a bite to eat. I had steak and Diana a meat pie. With a pint of ale of course. The next day we set off for our first day of hiking. 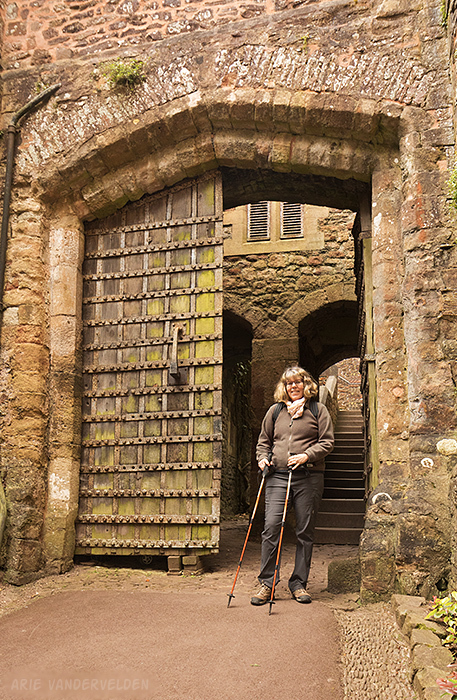 We hiked a short distance along the coast and then headed inland on a country road to Dunster, a village with a well-preserved historical center and a castle up on the hill. Dunster. The octagonal building in the center is the old yarn market. 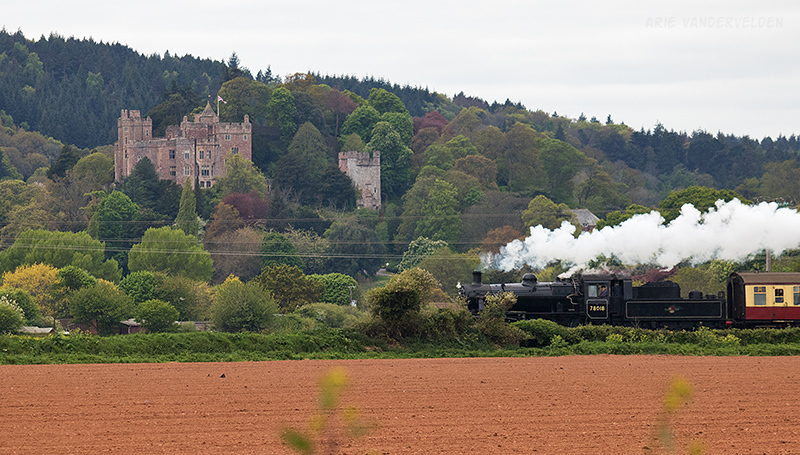 In the distance on the hill is Dunster Castle. We had a look at the local parish church. Inside there was a book sale raising money for the church. Diana bought several novels. 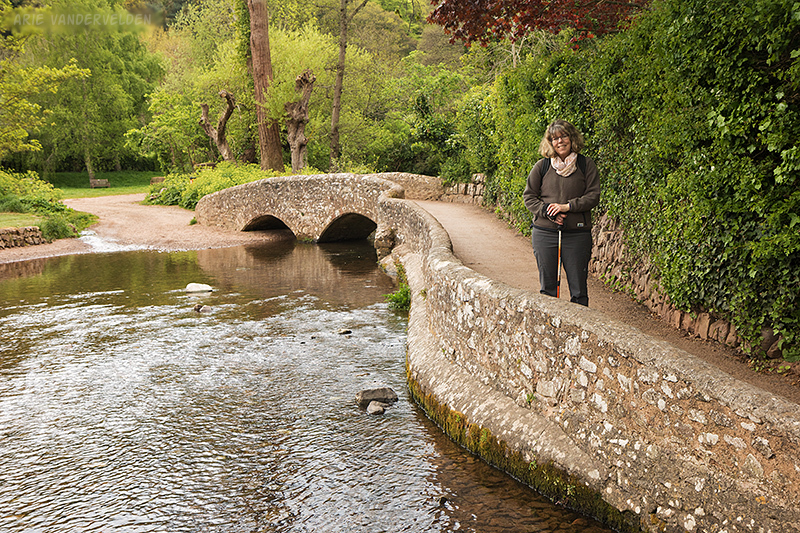 Dunster is very pretty. There are a lot of well-kept cottages, whitewashed, with thatched roofs coming down almost to the ground, and their gardens filled with flowers. These are the quintessential English “chocolate-box” houses. Towards the castle is a pretty little stream. The castle used to be a private residence until the owners went bankrupt in the late 1940s. The rooms are decorated mostly in 1930s style. On the outside, though, the castle looks thoroughly medieval. Now the National Trust manages the castle. After wandering around the castle we set off for Minehead, our destination for the night. 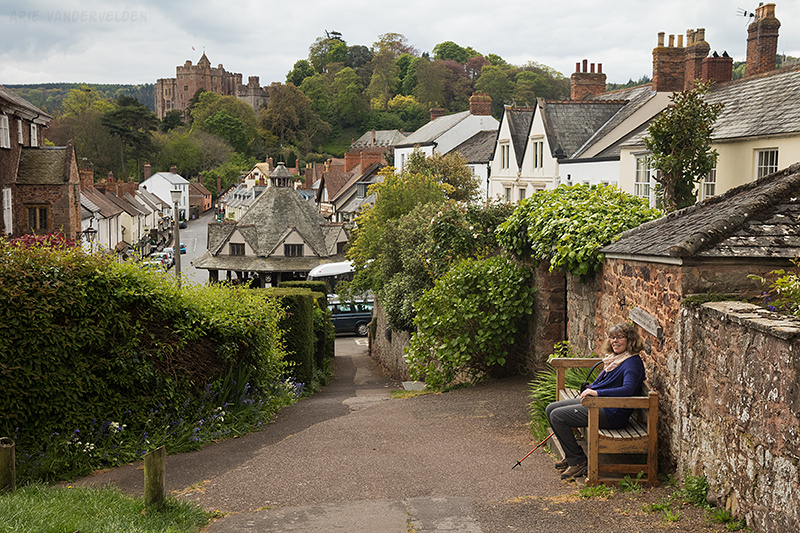 Rather than backtracking to the coast we chose to go across a hill behind Dunster. 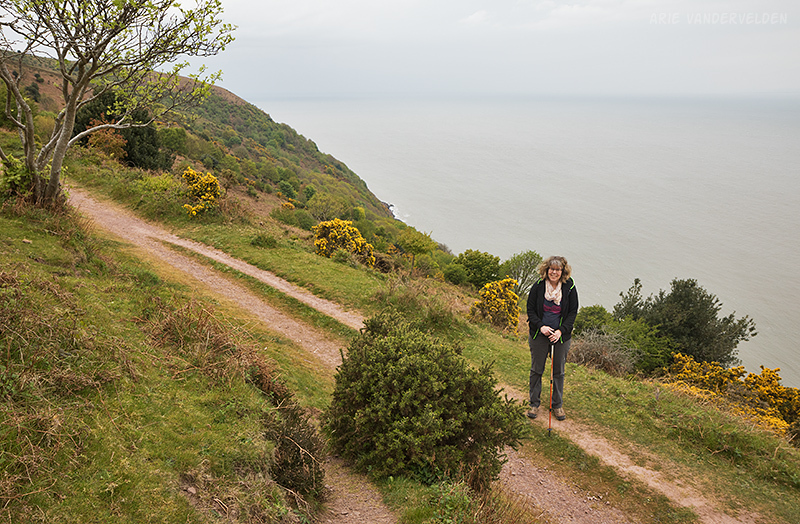 There was a myriad of trails, but we managed to find our way across and descended into a steep-sided valley, where a country road led to the outskirts of Minehead. We timed our stay in Minehead quite poorly. It was a Saturday night of a bank holiday and our room was pretty much right over top of the big nightclub in town. It was not quite as bad as we expected although there was quite a bit of drunken hooting and hollering outside of our window. 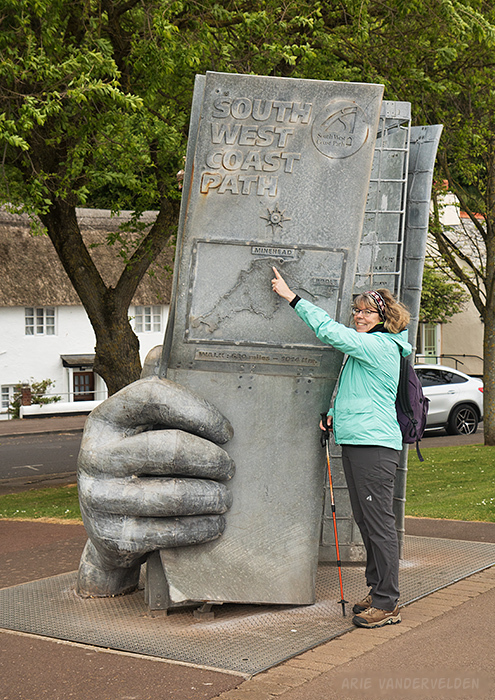 In Minehead, the official start of the southwestern coastal path is marked by a statue. 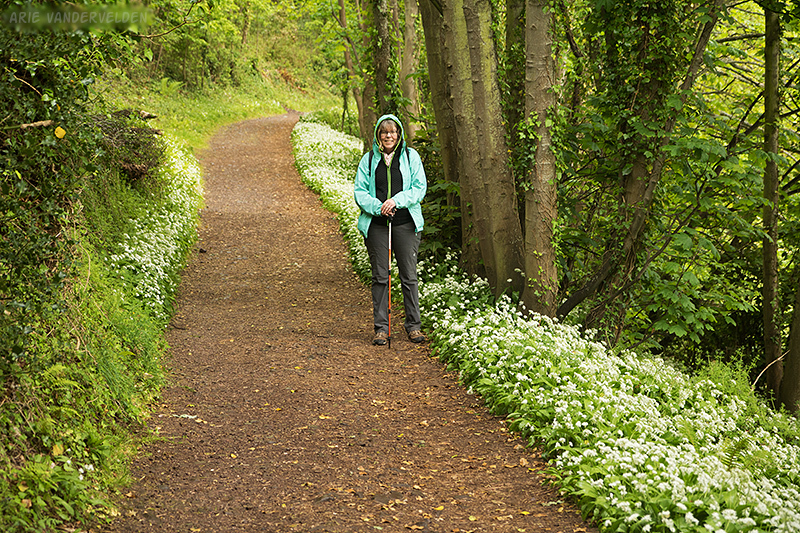 The trail starts at the waterfront, heads down the Esplanade, and at the end of the Esplanade a hiking trail heads gently uphill into the woods. The woods were filled with birdsong. There were European blackbirds (thrushes), robins (real robins, not thrushes), chiff-chaffs, cuckoos, and more. 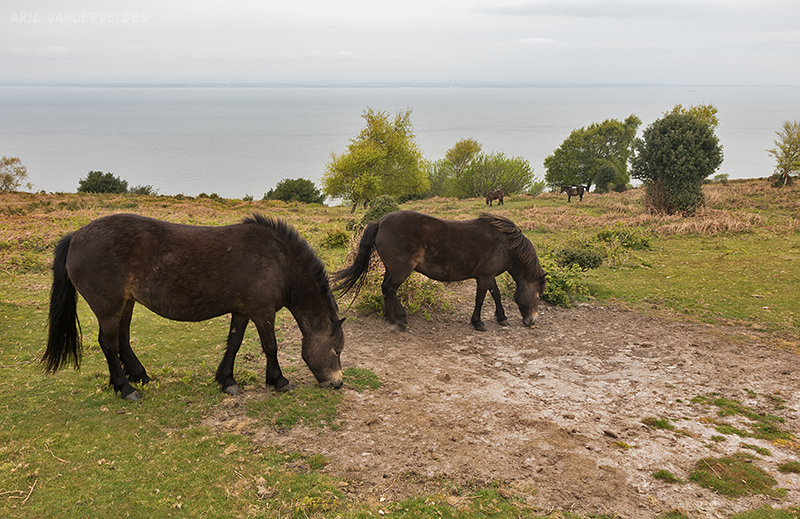 Eventually the trail tops out at the edge of the Exmoor plateau where there are extensive views of the Bristol Channel to the north, and the bleak, treeless expanse of Exmoor National Park to the south. Edge of the Exmoor plateau. Here the trail splits and there are two options. One trail follows the coast more closely, going up and down valleys. The second option cuts around the heads of these valleys across the moors. Given the deteriorating weather we chose the latter option. As we neared the edge of the plateau, the light drizzle that had been coming down earlier in the day turned to a steady rain. The trail dropped down a steep rubble-filled gully, at the bottom of which was a wide, level path with some protection from the elements. 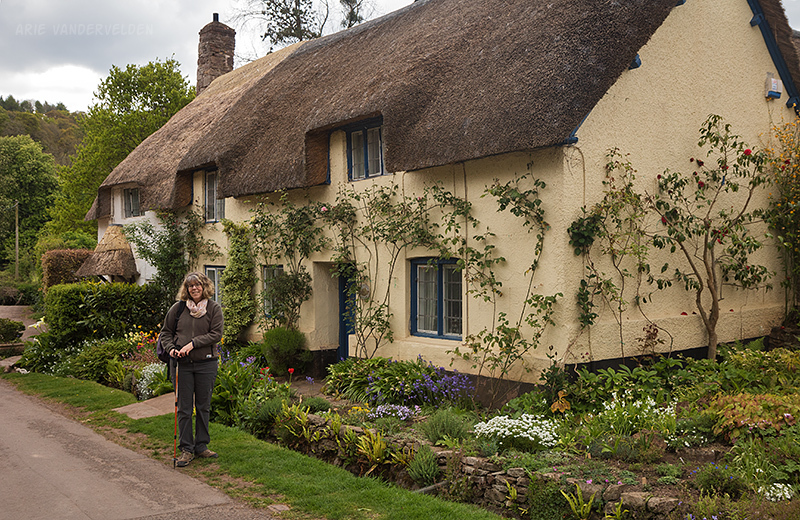 The pathway led to the hamlet of Bossington where we spotted a tea room set in a very cute thatched-roof cottage. 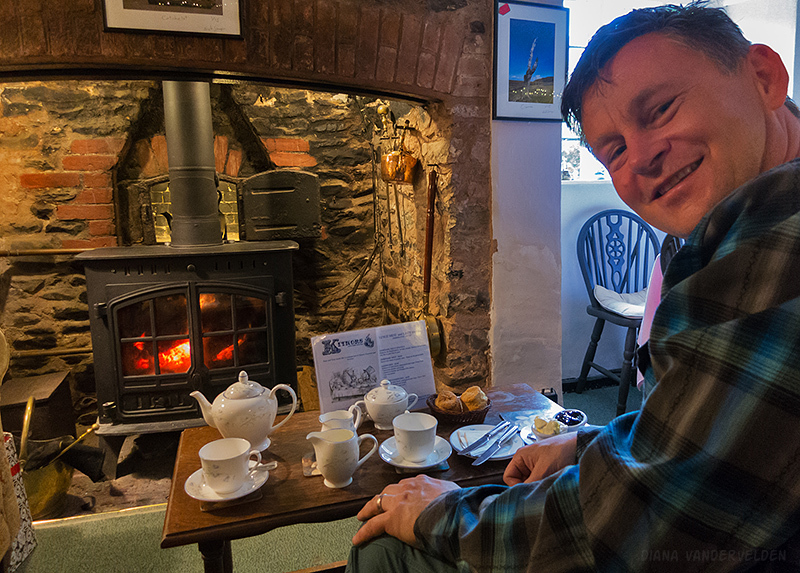 We took off our soggy gear, plunked down in front of the crackling inglenook fireplace, and ordered a cream tea for two (tea and scones, clotted cream, and preserves). It was hard to tear ourselves away from this cozy place but we still had a few more kilometers to go. From Bossington we walked along a narrow country road lined with fancy mansions to Porlock. 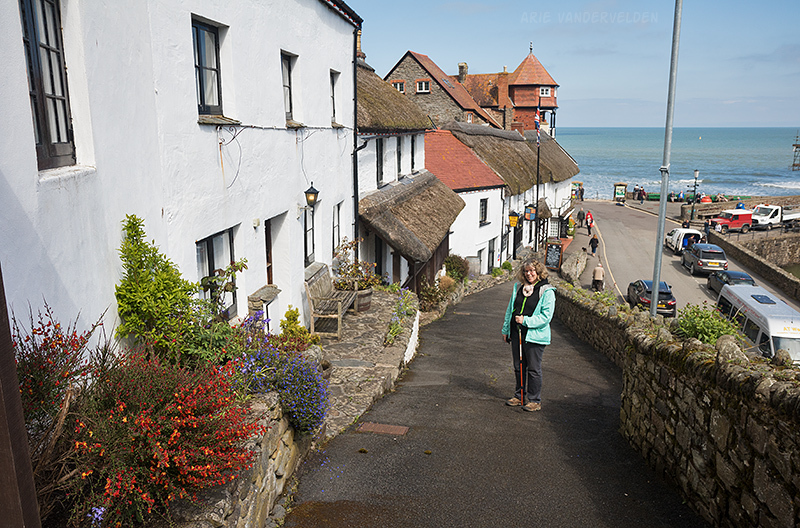 Porlock is a pretty village with a historic main street. We settled into our B&B, and then wandered over to the village hall where there was an antique sale going on. I struck up a conversation with an elderly gentleman who was selling some antiques. He had a silver soup ladle for sale, and I ended up buying it from him. A nice souvenir. Later in the evening we decided to go to the local pub for a bite to eat. It was just around the corner and across the street from the village hall. As we entered the older gentleman whom we bought the spoon from stumbled out, a rosy glow on his cheeks. I guess the 25 quid I paid was burning a hole in his pocket, and he had decided to go for a few pints before going back home. We said hi again. The pub was really nice and traditional. We enjoyed our dinner and a pint. That night, while staying in our cozy B&B cottage, I could hear rain pounding down against the windows. I thought uh-oh it’s going to be a soggy day tomorrow. But by morning the rain tapered off, and the landlady assured us the weather was clearing. 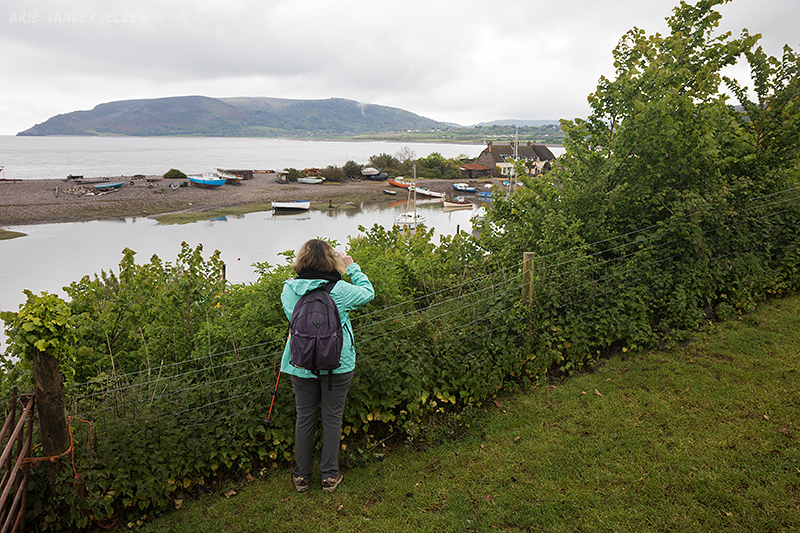 After a full English breakfast we set off down the road, through the delta, and onto a shingle beach toward the pretty village of Porlock Weir. Porlock Weir has a little harbour behind a gravel bar. I doubt if it offers much protection from big storms and storm surges. Beyond Porlock Weir the trail heads into the forest. We passed an old tollhouse, and from there it goes along a forested sidehill, mile after mile, with very few views of the sea. The hiking was pleasant, though. There was lots of greenery and the birds were singing. However there were some ups and downs that seemed unnecessary . I imagine these are probably related to property lines. 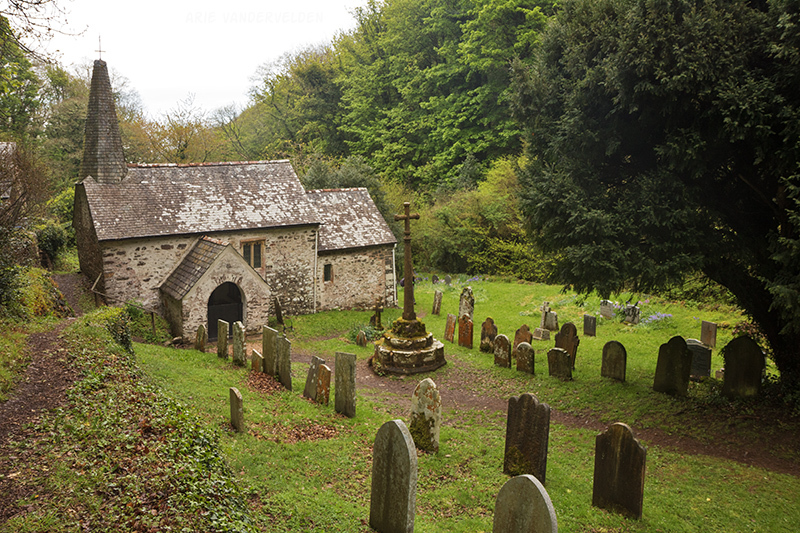 At a location called Culbone there was a pretty little church tucked inside a lush valley. As the day progressed the weather continued to clear. At a clearing we found a bench. We sat down for a cup of tea and a scone. Time for tea and scones. The trail then headed upward around a slide area. Somewhere in this area we crossed from Somerset into Devon. 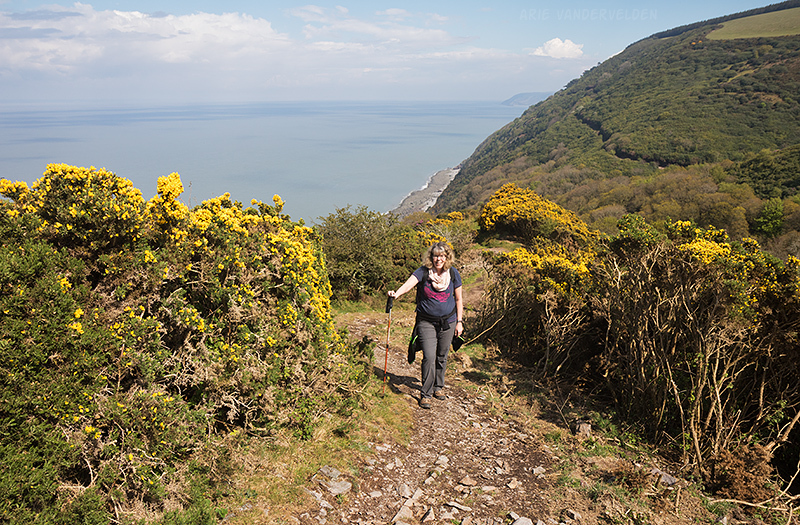 Hiking from Porlock to Lynmouth. Late in the day the path crested a hill, and we headed down into a deep grassy valley. There was a road coming down this valley that led to a lighthouse. Could we round the next headland by going down to the lighthouse and staying low? Or should we head upward, back up to the plateau, across the top of the headland? We weren’t sure whether there was going to be a trail beyond the lighthouse so we chose the safe but tiring option of going upward. Near the top a thick fog rolled in and visibility became very limited. 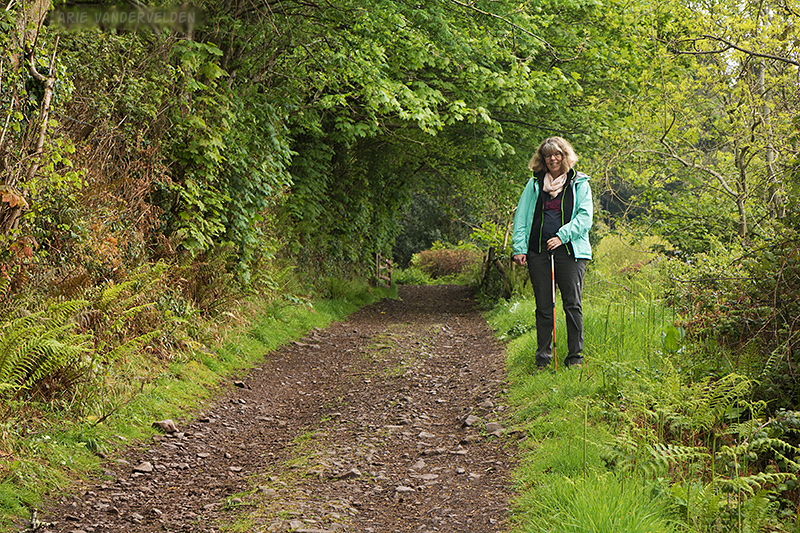 The trail led to a place called Countisbury Hill where there was a little parish church and a road. We ended up crossing the road and hiking down a trail into the Lyn Valley. Later on we found out that the coastal path actually follows the road directly into town, but due to the thick fog we missed the turnoff. In the end our trail got us there just fine. It was a gradual downhill and it was well signed. The last bit of trail was very scenic, along the banks of the river Lyn which tumbles downhill across great big boulders. 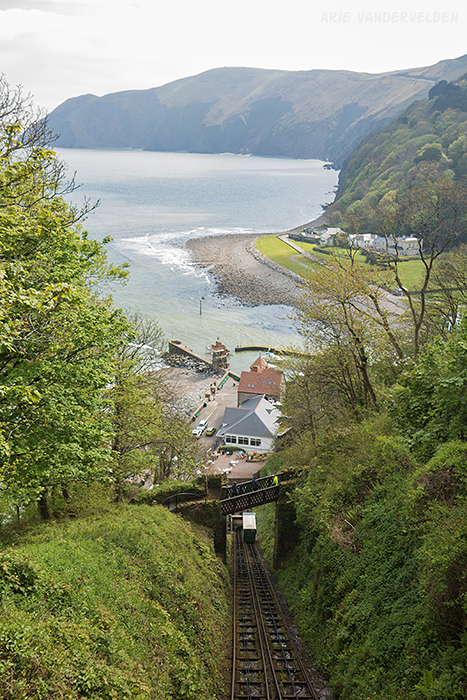 Our destination has two sister towns: Lynmouth and Lynton. 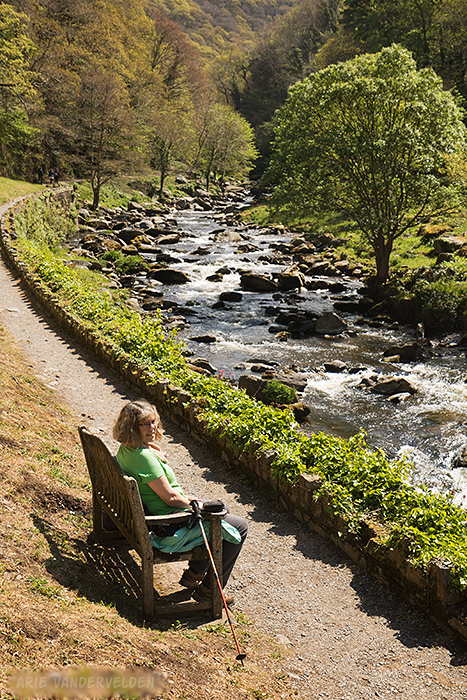 Lynmouth, as the name implies, is located at the mouth of the river Lyn, near seal level. 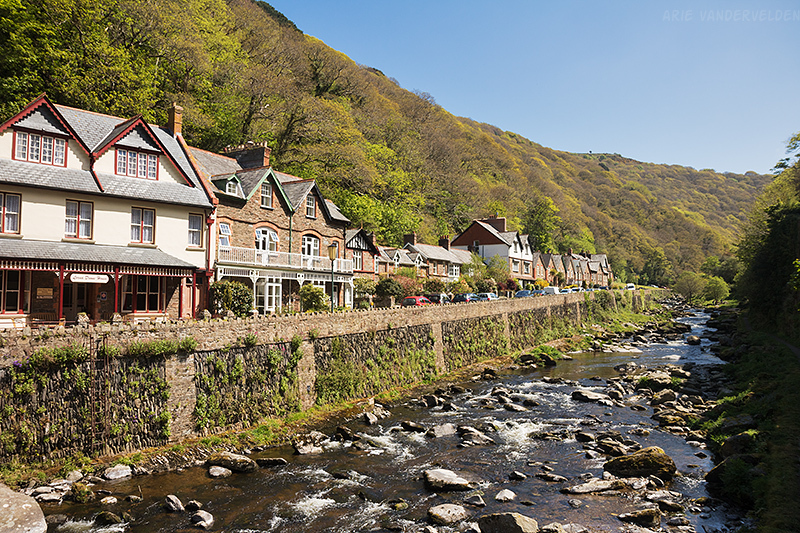 Lynton, on the other hand, is situated in a hanging valley about 700 feet (200 m) above Lynmouth. Connecting the two towns is a funicular railway that works entirely on water power. It’s a marvelous piece of Victorian engineering. In essence there are two cars connected by a steel cable that goes around a pulley (bullwheel). The bullwheel is just above the top station. One car will be at the top station and the other at the bottom. A creek has been diverted to the top station. Each of the two cars has a ballast tank that can hold water. When it’s time to go the car at the top is filled and the bottom car will discharge water. This makes the top car heavier, and it will then move downward, pulling the bottom car upward. Simple Newtonian mechanics! There is a water-powered braking system was well. Because it was late in the day and our feet were sore we chose to ride the funicular railway to the top. I think we just caught the last ride before it closed for the day. Our B&B was just up the road in Lynton. The next day we took a day off to recuperate and to check out Lynmouth/Lynton. This time we hiked up and down the headwall. 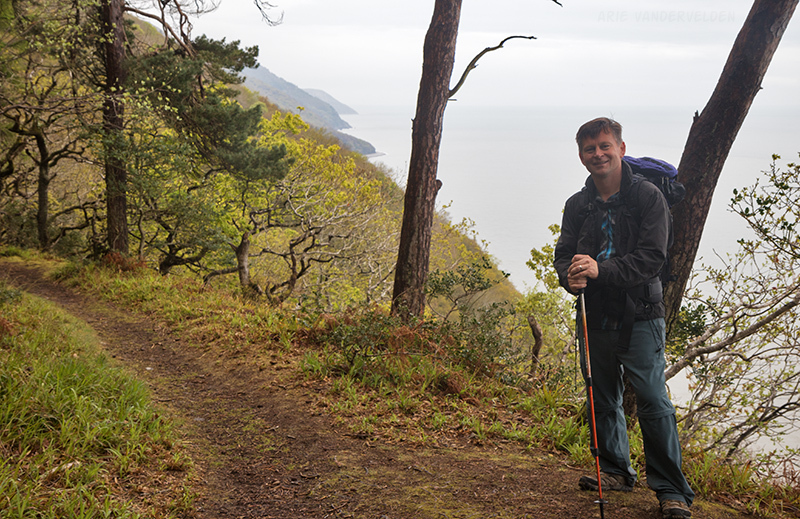 Trail from Lynton down to Lynmouth. 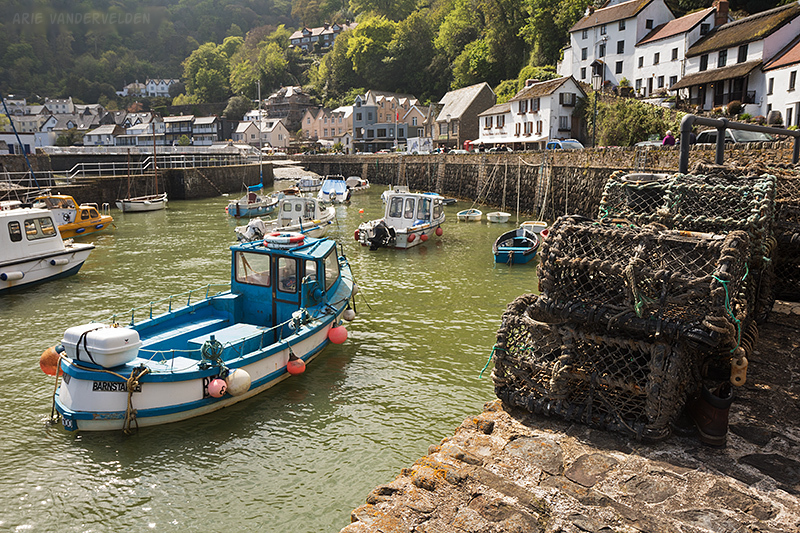 Lynmouth Harbour is tidal. At low tide the ships are grounded, and they can only leave or enter port when the tide is high. 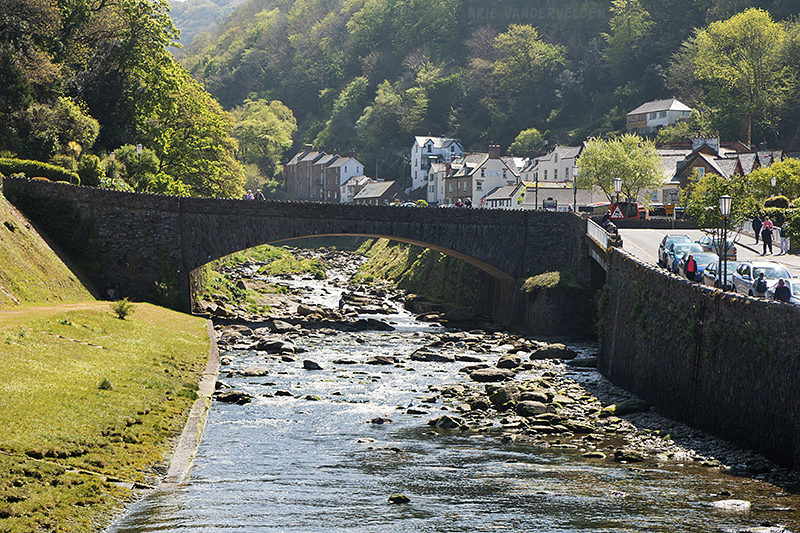 Lynmouth is spread out over the small delta of the river Lyn. It also extends upstream a bit where houses are nestled up against the steep valley walls. We hiked back upstream a bit along the banks of the river Lyn. We lounged in the sunshine, enjoying the fine weather, doing nothing much in particular. 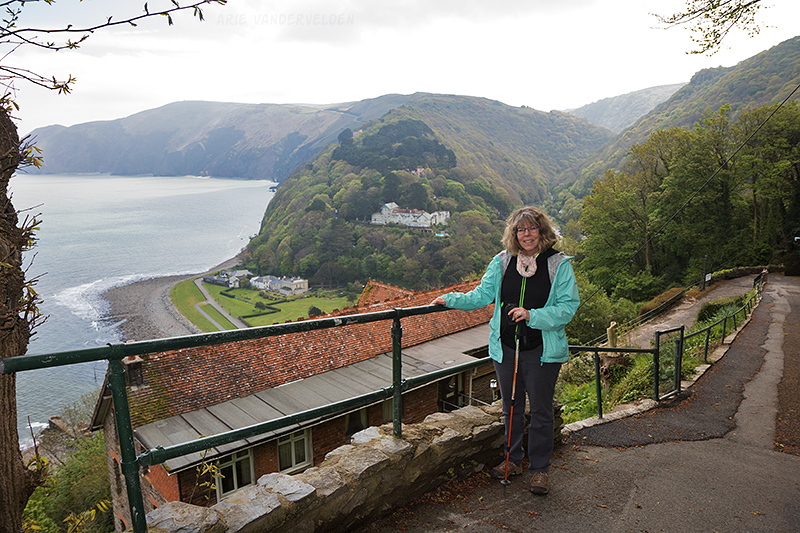 Continue to part two: Lynmouth to Ilfracombe. 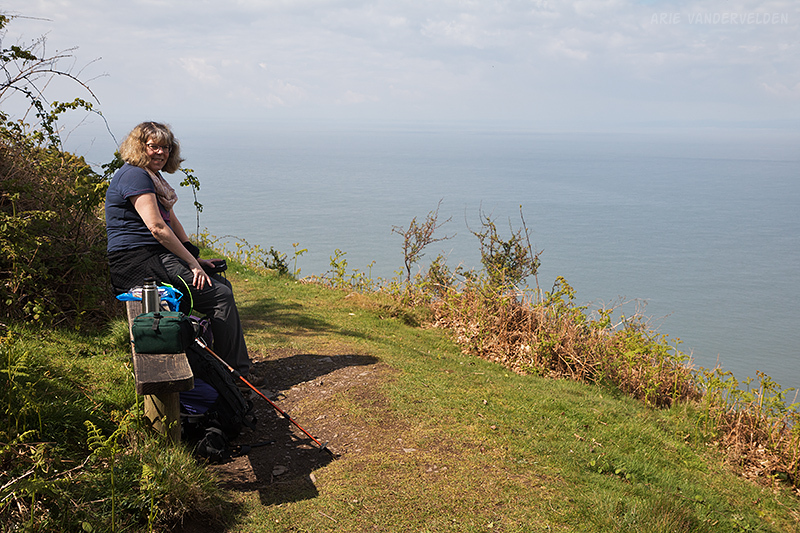 As mentioned, this hike is part of the southwest coast path in southwestern England. In Blue Anchor Bay we stayed at the Blue Anchor Pub (very good food). In Minehead we stayed at the Duke of Wellington (okay, but avoid on a Friday/Saturday night due to nightclub noise). In Porlock we stayed at Sea View B&B (quaint and friendly, recommended). In Lynton we stayed at The Fernery B&B (the owner Jo is very friendly. We liked her a lot. Very good breakfasts. Highly recommended). We hiked the trail in late April/early May of 2017.